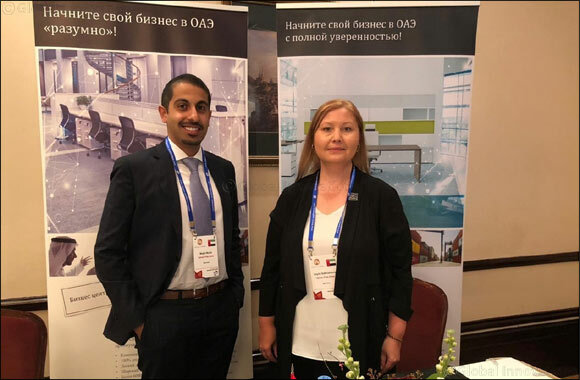 Dubai, UAE, April 15, 2019: Representatives from Ajman Free Zone showcased the benefits of establishing a business in Ajman to a Russian delegation at the BOSCO Conference in Moscow this week, held at the Marriott Grand Hotel. Bosco Conference events are well known for their annual international VIP-class conferences, InvestPro and WealthPro, which the company holds in the countries of the European Union, the Middle East, the Baltic States and Eastern Europe. Ajman Free Zone has attended previous events held in the UAE, Russia and Azerbaijan. The conference's speakers and partners are the world's leading experts in providing corporate and banking services, asset protection and confidentiality, private capital management, International legal structures, business immigration and citizenship. The conference audience in Moscow consisted of business owners, executives and financial directors, lawyers, private investors, high-net-worth individuals, asset managers, private client advocates, bankers and consultants. Sales Director, Majid Al Mulla and Sales Executive, Leyla Sakhabiev of Ajman Free Zone attended the event and met with several parties interested in developing their companies in the UAE. Attendees were impressed by the range of benefits offered by Ajman Free. Leyla Sakhabieva also made an address as part of the conference speaker itinerary where she shared the numerous advantages of Ajman Free Zone to potential investors.